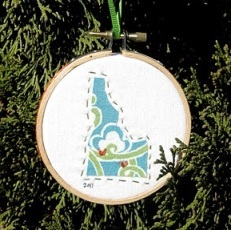 Chris from Pickup Some Creativity shares a tutorial on her blog showing how to make her “Love Where You Live” Christmas ornment. I love this idea!!! The colorful state silhouette and handstitched outline are so cute!! You could make one to celebrate all the places you’ve lived. The tutorial is part of the Haul Out the Holly series by Gwenny Penny. Get the tutorial.